A bold and engaging interactive work which enlivens the public realm. The work recognizes the contributions of the 4,300+ donors to UBC’s multi-billion dollar, seven-year “start an evolution” fundraising campaign. 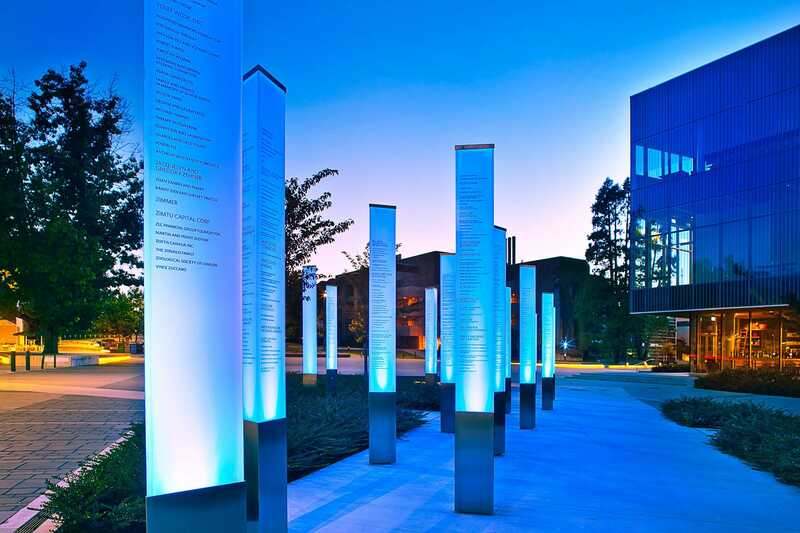 Placed in a seemingly random scattering at the pathway intersection, twenty triangular pillars create a bold, vertical “surface” of light. This becomes almost an “outdoor room” once you are inside it and is visible from afar in both day and night. The light colour palette was specifically selected to coordinate with both the UBC brand colour—blue—and the fundraising campaign colour—magenta. As visitors walk through the forest of pillars they find themselves enveloped in the subtle glow of blue-green lights. The visitors’ movement triggers motion detectors to shoot a ripple effect of magenta light through each acrylic lamp. Visitors will notice that as they approach one pillar, their presence changes the light of that pillar, and then another neighbouring pillar, and then its neighbour, and so on enveloping the sidewalk in a ripple of magenta light.